Ok, so I am really really hoping that I can do our kitchen reveal tomorrow. We are waiting on ONE item to complete it and it’s driving me a little crazy. I want to share the end results and hope that the item we need comes in today like we were promised (it actually should have been here TWO weeks ago!). So instead of the kitchen reno reveal I will share how we are making our kitchen space work for us so far. 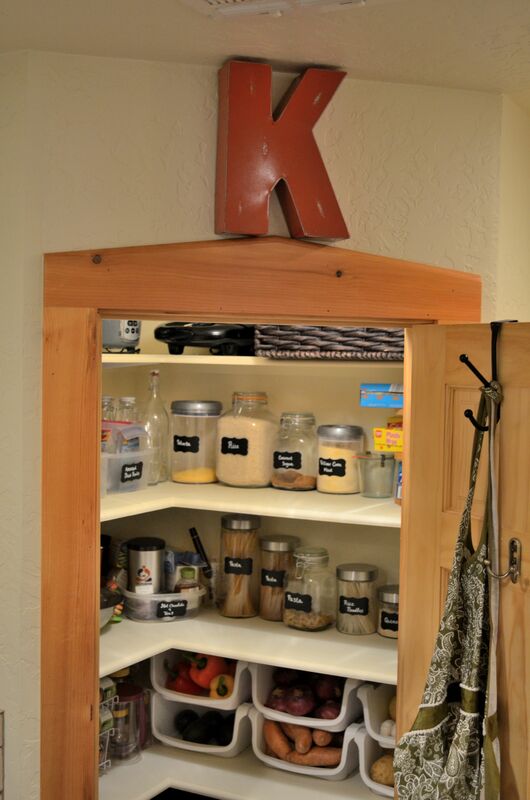 I will start with my favorite area: the pantry! The “K” is for our last name but as Mr. HungryYogi put it up he asked if it was for “Kitchen” which you know I guess it could be as well. I seriously love this pantry y’all. It’s big and can fit pretty much everything we need it to fit and more. 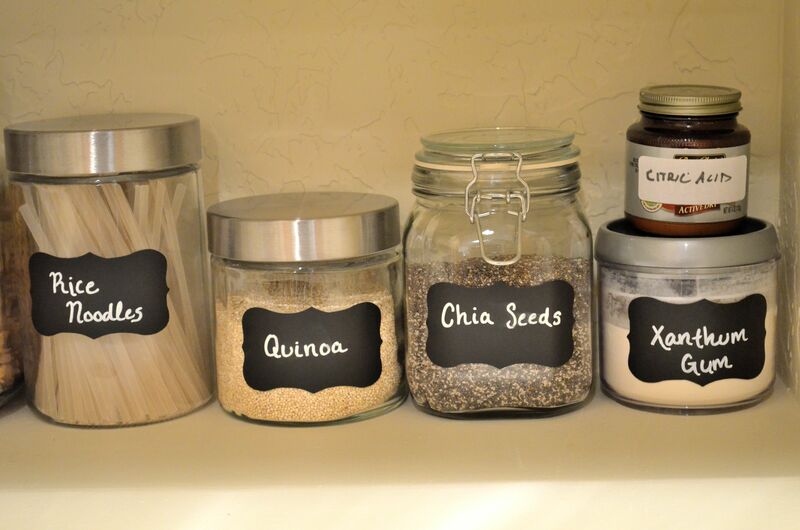 I decided to put as many things as we could in glass jars and label the jars to make finding items easier. 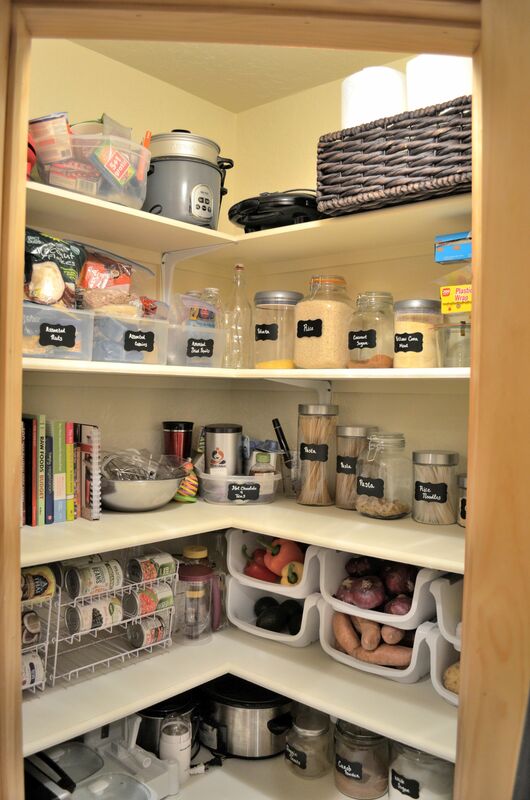 For miscellaneous items that we buy we placed them in clear large plastic containers which are also labeled. Gotta have a storage container for teas and hot chocolate. 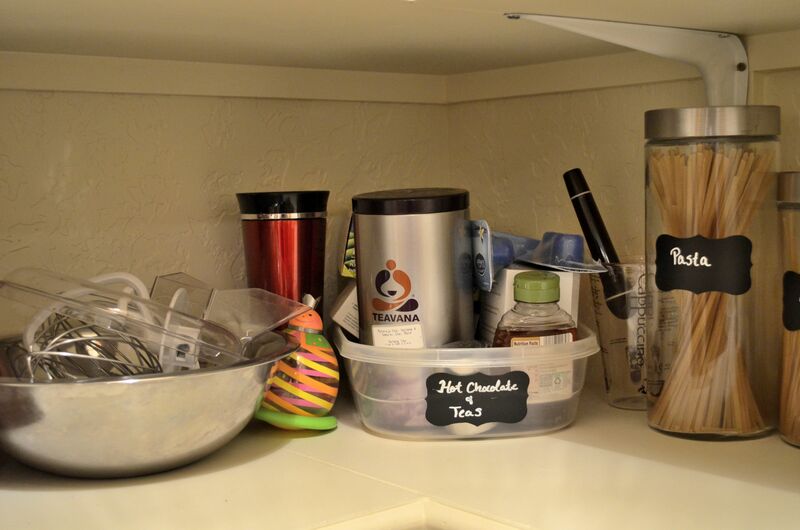 Next to the teas and hot chocolate is a bowl that holds all of the KitchenAid mixer accessories. Novels feed my soul but these bad boys inspire me to feed my belly. We don’t buy too many canned goods but I do have a few I like to keep on hand such as black beans, chickpeas, diced tomatoes, pumpkin, and coconut milk. 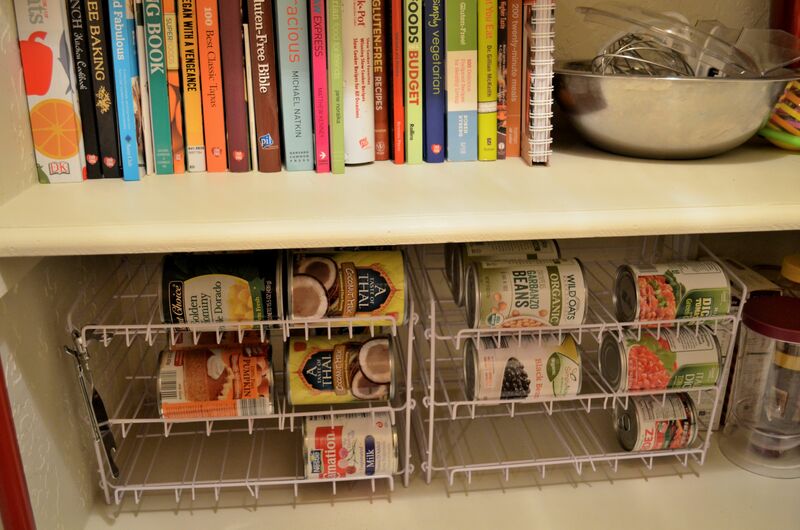 I love this canned good storage unit to house them. 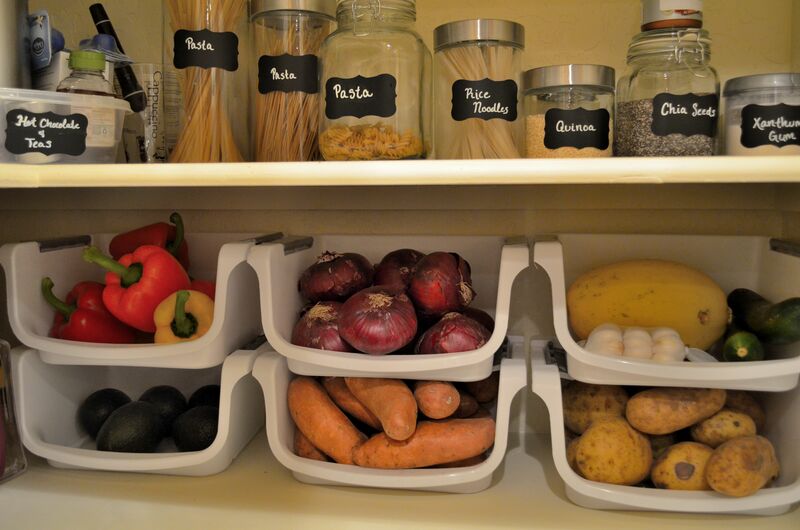 These containers are handy for root veggies and veggies that last longer out of the fridge. I love the pantry and it still needs a little tweaking but it’s working really well for us so far. 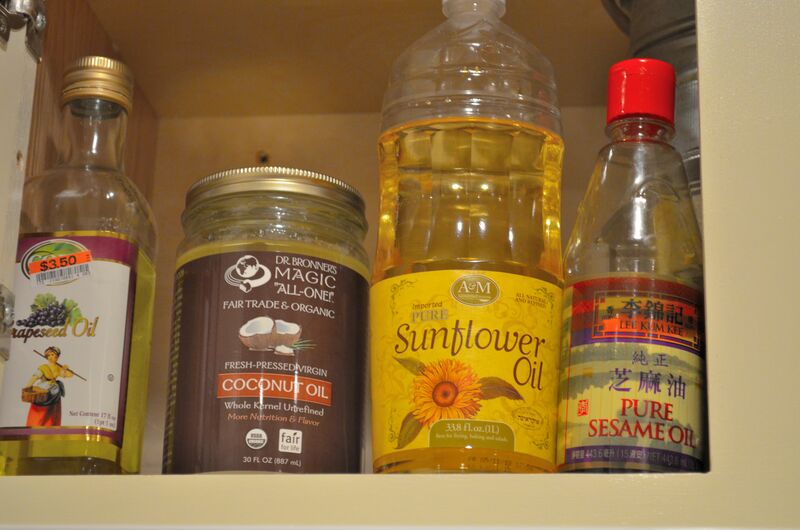 I keep the oils above the stove for easy access. 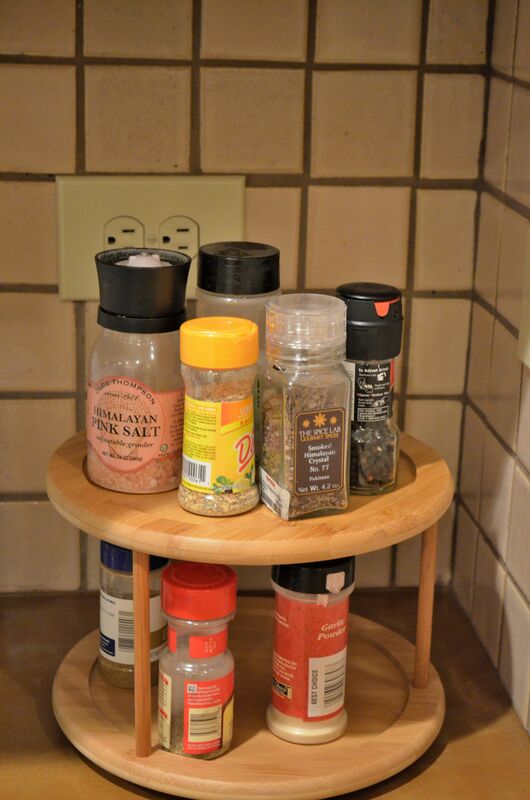 The seasonings are next to the stove in a top cabinet and stacked so that I can easily identify them. 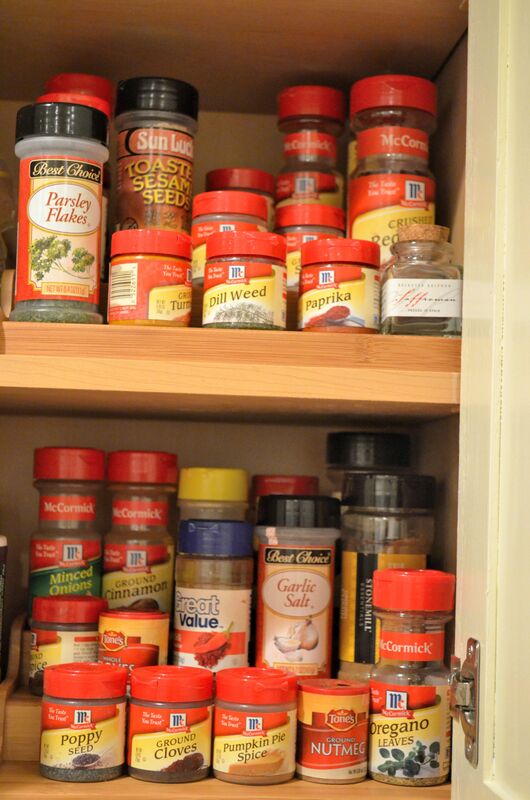 I think I have too many seasonings. 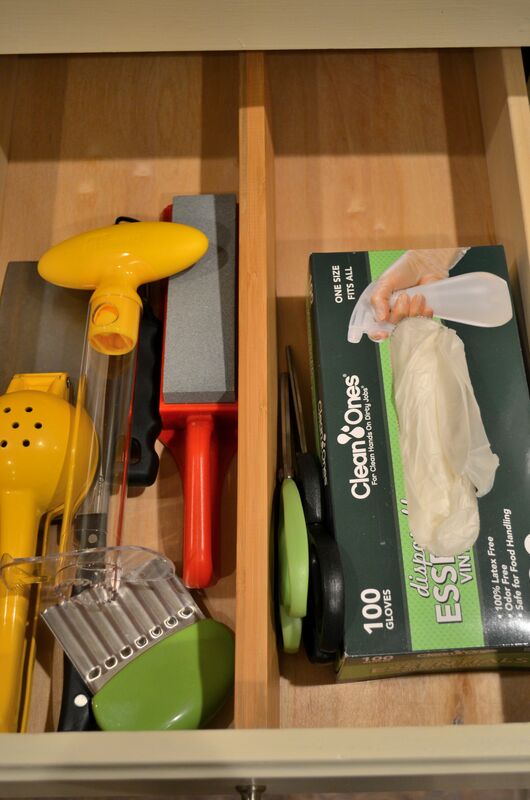 The ones I use most often are kept out next to the stove. 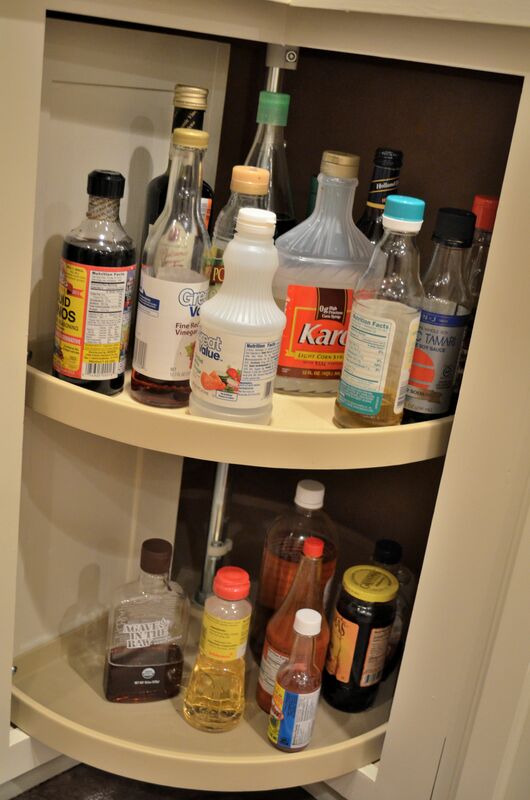 One of the Lazy Susans in our kitchen is used for storing random sauces, vinegars, and so forth. Not really organized and in need of some major TLC. 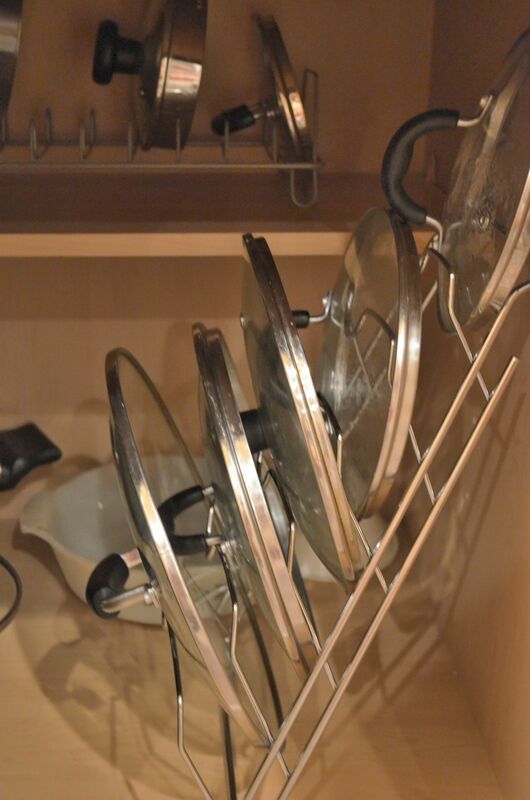 However, the other Lazy Susan is a HOT MESS and I seriously need to figure out how on earth to make them work for me. 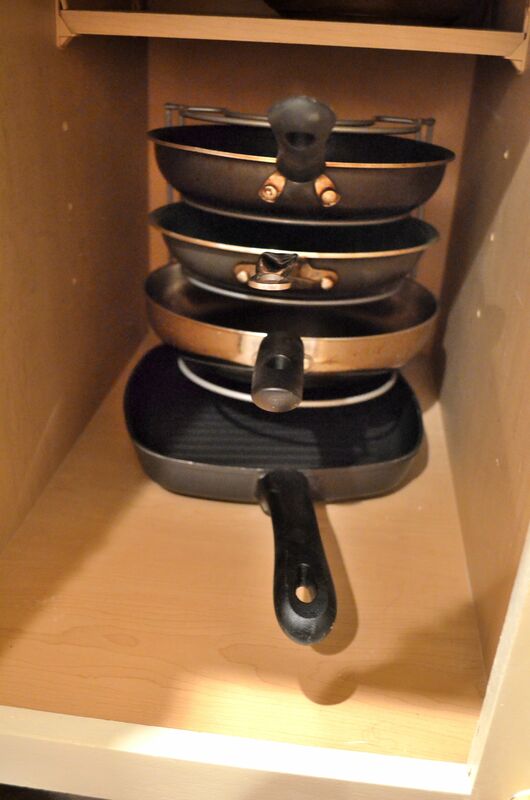 I keep pans I use a lot in a stackable cart for easy access. Same for the lids. This actually needs to be drilled into the cabinet door but we haven’t gotten to it yet. It makes storing lids an easy task though. You can kind of make out the second lid container in the back. 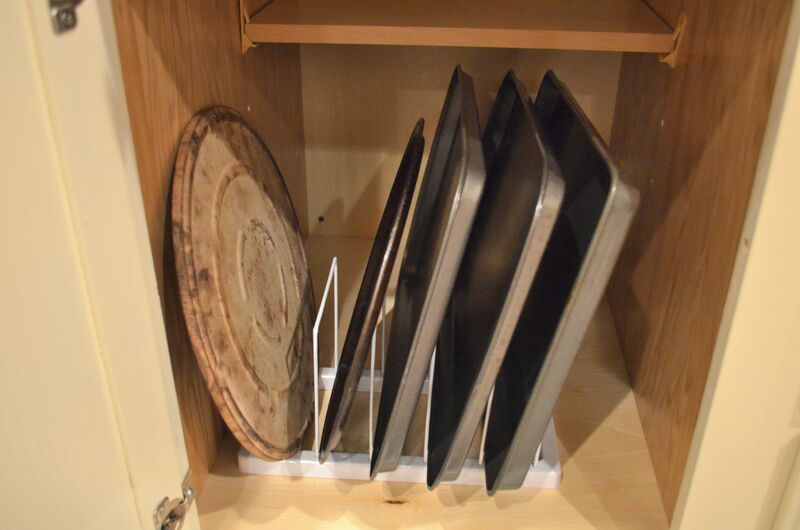 And this item has come in major handy for keeping baking sheets organized. I also have one for cutting boards and another for serving trays. 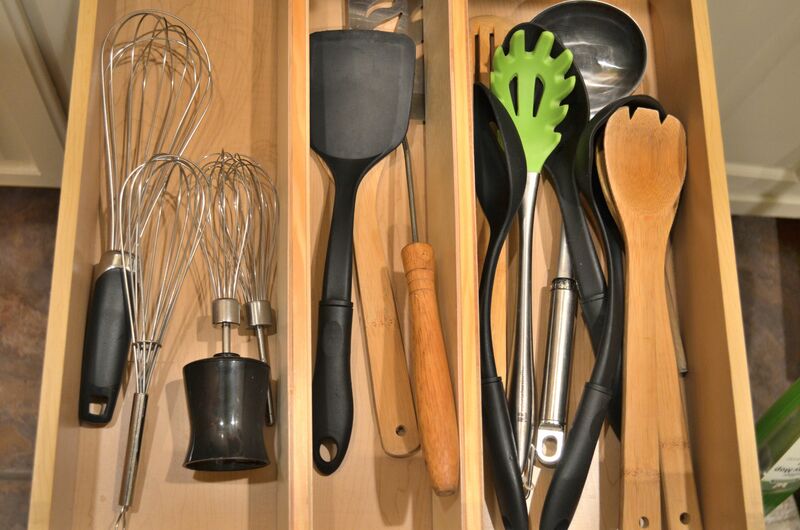 A sample of our top cabinets and how we organize them. 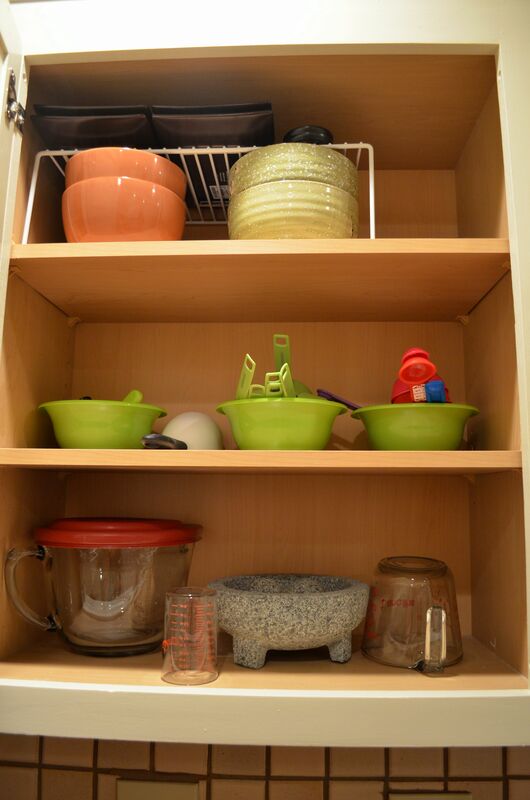 This one stores our measuring cups, large soup bowls, sushi platters, scoops for the glass jars in the pantry and clips. 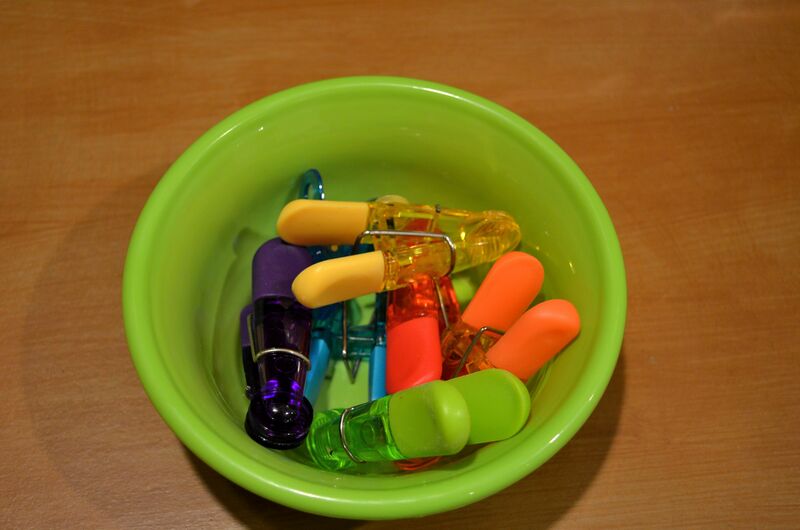 I found that using a bowl for clips really helps us. We also use a bowl for the measuring cups. 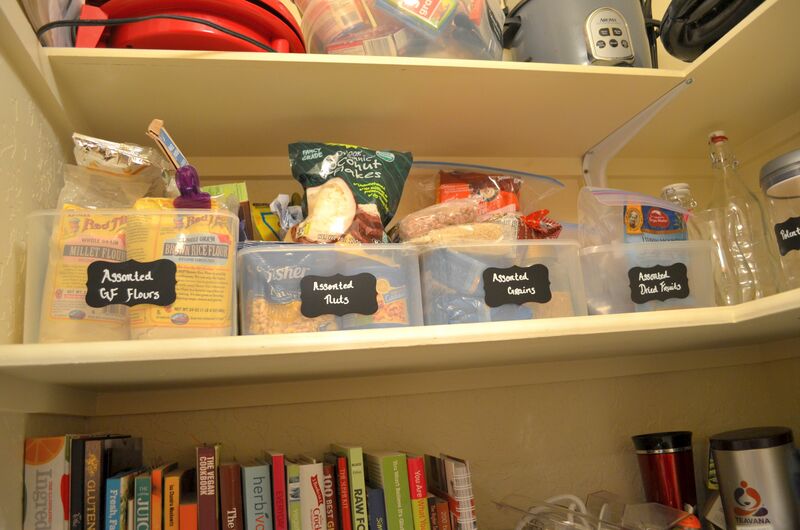 Another favorite item for organizing are drawer dividers. 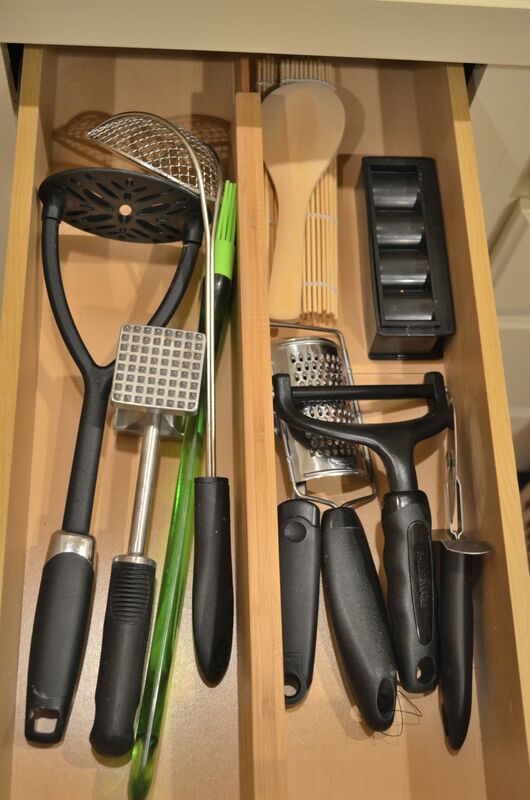 These things make storing things in drawers really simple. I love the simple, less cluttered look they provide. So that’s where we are: trying to organize our kitchen space. 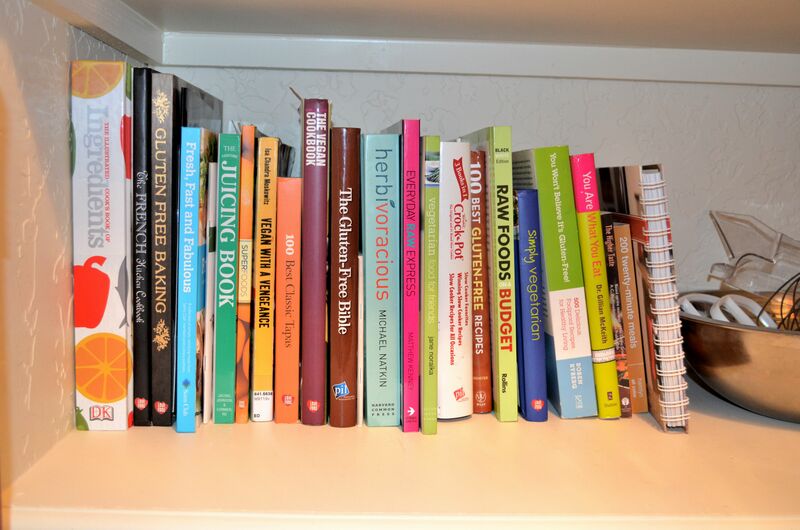 If you have any tips or suggestions on how to make a kitchen more functional,please share below! Especially if those tips include what on earth to do with Lazy Susans! Your attention to detail in your Magic House blog is soooo helpful! So many times I read blogs and think “but what happened about…” and you come up with the answers! You write in such an uplifting way too – you have inspired me to start my own blog. But first I have to do something worth talking about! PS I also have a susan which is lazier than it should be. Needs more like rescus than TLC. Haha mine are still a mess! I need to figure them out… soon!